The first race with BHFR and I’ve volunteered to write the race report – obviously a sucker for homework! I thought I had entered the Brighton 10K before, but then it occurred to me that I had the best of intentions a few years ago and never actually committed so despite running along the seafront several times, this was going to be my first Brighton 10K. I only signed up after becoming a BHFR member so maybe it’ll be the start of a new tradition. I can’t say I was overly prepared, I hadn’t ran more than 7km after a truly gruelling London Marathon back in April making sure I stuck to the shorter distances. Even then, following a new addition to our family in the summer, most my running has been limited to running with a buggy, so I’ve completely forgotten how to use my arms. My preparation on the day didn’t go that great either. After repeatedly forgetting the start time (and having to ask fellow BHFR members a couple of times), there was a planned group photo at 9am outside Charles Street, with some London Frontrunners who were also entering. My bus disappeared from the live tracker, a regular occurrence on Brighton Buses, forcing me to run 1km down to the next bus route so I ended up missing the photo call by a few minutes, but at least now I was warmed up. Note to self, maybe I should cycle to start of future races. Thankfully, the organisers were better prepared than I was. A bitter cold morning meant no one was willing to drop bags until the last minute but there was enough marshalls to cope with the demand. After catching up with a few fellow BHFR peers, 9 of us were signed up to start the race, we set off to our relative starting pen. I decided just as I started I wasn’t going to look at my watch for the duration of the course, time checking every kilometre seems to make me get all up in my head and either stress about running too fast or too slow. At the end of the day, I was starting with people expecting a similar time, I’ll just run alongside them and enjoy the run. So we we’re off, running towards Hove on closed roads (also another plus). Once my limbs were warmed up the chill had dropped off, and I was super glad that I grabbed my sunglasses on the way out as the sun was blaring down. This maybe was going to be a good run after all. There was a huge temptation to look at my Garmin every time I heard it beep at a kilometre marker, especially as we hit 5 kilometres, but I resisted and I was just enjoying the run for what it was. This was going very well. The course looped back just before the King Alfred, putting us on the beach promenade, where the wind picked up a little and started to feel a chill. Once we looped past back the peace statue we were back on the road, where there seemed to be a giant inflatable duck running the other way. The Brighton 10K is also the Vegan Runners championship race, so not only were they out in force, they had also brought along a couple of inflatable animals to run the course with them. I spotted a duck and a fish (or was it a shark? ), it definitely made the run more interesting. Just outside the Grand Hotel, the BHFR Cheer Squad were there with Rainbow banners and flags – having someone cheer you on gives you such a massive boost. So after a quick wave back it was back to the running with a massive smile on my face. At the 7km mark, you run past the finish, where the elite runners were already approaching the finish line. I always find it amazing how effortless these elite runners look when they’re going at the speeds they run out. My partner is always quick to remind me that I look like a giant tomato when I run, so I am quite envious of anyone who can run without looking that they’ve broken out into a sweat. The envy soon passed, as I realised I still had 3km to go and the wind was starting to pick up. At the 8km marker I was starting to find I was running out of steam, with a couple of runners taking over. Someone shouted how much time had passed, just before the turn back point. I think I heard 37 minutes, but I convinced myself I heard wrong, as that would mean I was going ridiculously fast. I then hit the 9km marker and heard my watch bleep. I ended up looking at it, it was an instinctual reaction. I saw that it said 37 and a half minutes. Although I was super pleased at the time I was doing, I was really annoyed with myself for looking and I automatically started debating whether I should drop back given I was going “too fast”. In the end I decided that although I was tired the quicker I ran the quicker it was over (sound logic) but for the first time in the race I was starting to feel tired and the enjoyment slipped. The wind picking up had definitely taken it out of me. At 300 metres, I could see the finish, so that kept me going – where I crossed in 41:44 – my second fastest ever 10km. I was super pleased with the result. It seems that running with BHFR has had a positive influence! The good organisation continued and I had my bag in seconds, quickly layering up before meeting the rest of the BHFR squad for brunch. Overall a really enjoyable run and a great result. In future I’ll be ditching the watch, running more with the buggy and ensuring that all future races has a BHFR Cheer Squad! 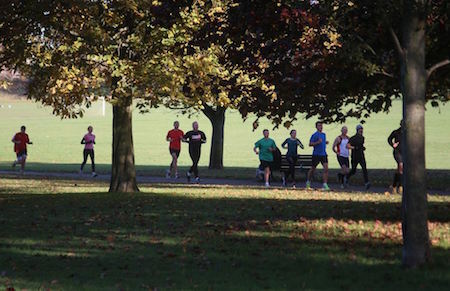 Our monthly group Parkrun visit is taking us to Preston Park this month, so if you’ve never done one now is your chance. We will be meeting 8.45 on the grass in front of the cafe. And will be in the cafe after. Hope we can get a good Frontrunners turnout. 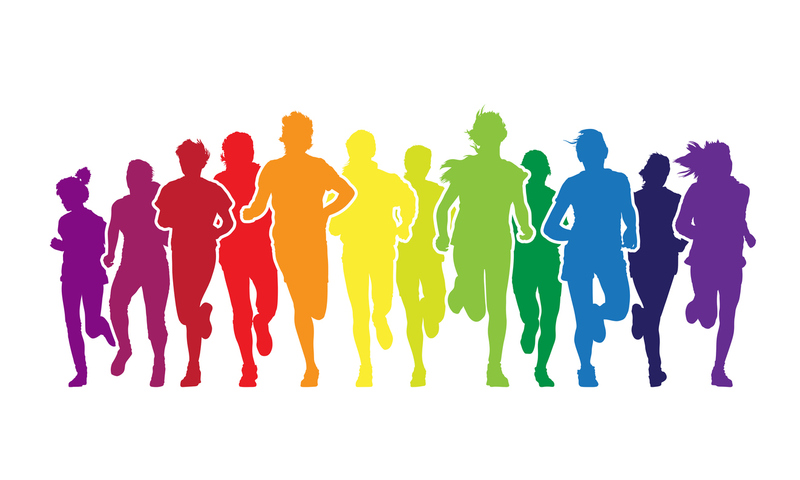 The 5K Parkrun starts at 9am. 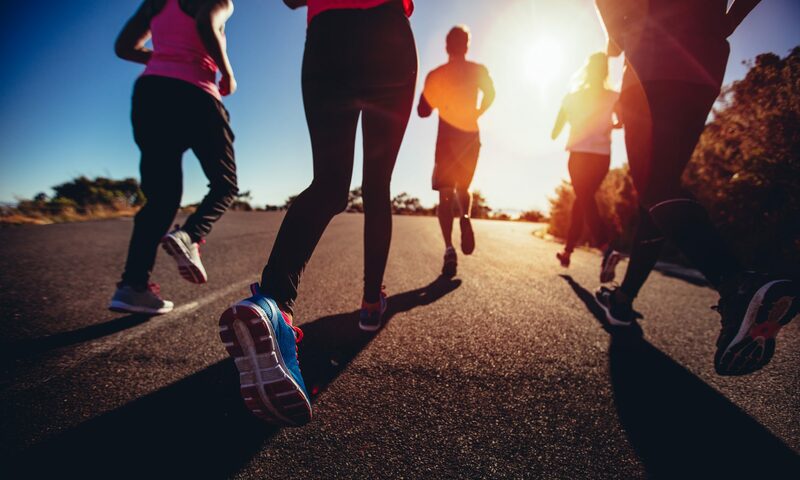 Welcome to the new Brighton & Hove FrontRunners website! Please check the latest news page for details of forthcoming events.